ST. ANDREWS, N.B. -- A 14-year tracking study is giving scientists an unprecedented range of data on young Atlantic salmon in four major East Coast rivers. The iconic species is famous for drawing anglers to the region, but researchers wanted to know more about their juvenile survival rates. 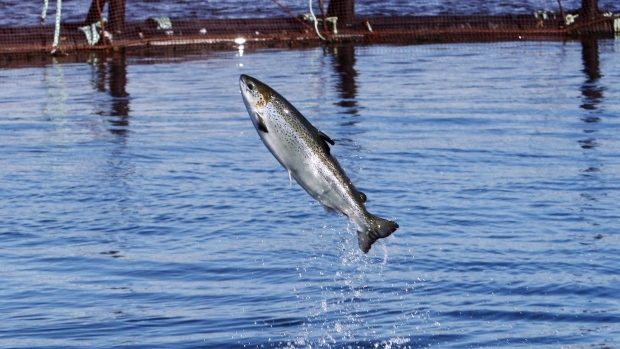 The findings, by the Atlantic Salmon Federation in partnership with Fisheries and Oceans Canada and the Ocean Tracking Network, are in a paper published Thursday in the ICES Journal of Marine Science. "The study started just due to interest and a lack of understanding as to how these fish are behaving and their survival as they are migrating downstream," said Jason Daniels, a research scientist with the federation and report co-author. "Acoustic telemetry has allowed us to have a bit of a window into what's going on." The complex technical study tracked more than 2,800 juvenile wild Atlantic salmon, known as smolt, from populations in four rivers that empty into the Gulf of St. Lawrence. They include the Southwest Miramichi, Northwest Miramichi, and Restigouche rivers in New Brunswick and the Cascapedia River in Quebec. Smolt were collected each spring as they made their way downriver and were tagged with small acoustic transmitters that monitored migration speed and survival rates. "Across the 14 years of study survival estimates varied without trends for the population of the Chaleur Bay, but declined for the populations migrating through Miramichi Bay," the study report says. The collected data indicated that fish survival depended on factors such as smolt size, distance travelled to open water, the conditions encountered, and the presence of predators. "There was a positive size-dependent probability of survival through the freshwater and estuary areas," says the study. "The odds of survival of a 16 centimetre smolt were 1.5 to 1.7 times higher than for a 13.5 centimetre smolt length at tagging." Survival rates for smolt tagged in the Restigouche and Cascapedia through their shared estuary Chaleur Bay fluctuated from year-to-year but remained relatively high -- 67 to 95 per cent over the 14-year period. Those rates were initially similar for smolt leaving the Southwest and Northwest Miramichi rivers and into Miramichi Bay, but that changed in 2010 when a "pronounced downward trend" began with survival rates fluctuating between 28 and 82 per cent. The drop in survival rates on the Miramichi was attributed to a rise in the population of the predatory striped bass population. The spawning population of striped bass in the river increased from about 15,000 at the beginning of the study to about 300,000 by 2016. "The spawning period overlaps in timing with the downstream smolt migration," says the report. "Atlantic salmon smolts have been identified in stomachs of striped bass sampled from the Miramichi." Other factors affecting the smolt survival estimates may include water chemistry in the Northwest Miramichi watershed and changing experimental conditions. Daniels said the higher mortality numbers for the Northwest Miramichi are a cause for concern given that the average return rate of smolts to the river is around two to three per cent. "When you see 80 to 90 per cent of those smolts disappearing just in the estuary before they even get to the ocean, you really scratch your head and wonder how you are going to see three or four per cent of those smolts make it back as adults," he said. The study confirmed that most mortality takes place in the first few days or weeks after smolt leave fresh water. However, the researchers said fish survival improves as the smolt move offshore. "The estuary is where the majority of the mortality seems to be occurring," said Daniels. "These fish have lived their entire lives in a freshwater environment and they are undergoing a lot of different physiological changes, so they are already in a state where they are stressed out." Aside from adapting to a saltwater environment, he said they also have to deal with another set of predators, so the results really aren't that surprising. "Being able to study multiple rivers at once across multiple years allows you to see these trends and compare them to rivers that don't have the same types of pressures," said Daniels. "You can see the relative impact some of these pressures may be having on particular populations of salmon."